Spring Renovations? Automate Your Shades. Now that spring is finally upon us, it’s time to let the beautiful sun shine in. We find ourselves at this time or year searching for a fresh take on our day to day lives. Breaking the seal on our windows to let the fresh air in after what seemed like an eternity, spring cleaning is beginning, wardrobes are being cleared out and updated and we all sing the same tune, “out with the old, in with the new”. New resolutions, new styles, new colors, new technology. New technology. This brings us back to letting the sun shine in. With so many advancements surfacing daily we often find ourselves also looking for simplicity in our hectic schedules. Easier ways to do the mundane tasks of our lives. Did you ever wish while sitting on the couch watching a movie that you did not have to get up to close the window shades or blinds to block out the sun’s glare? Have you ever considered waking the kids up for school by opening their window shades with the touch of a button? Has it ever crossed your mind that while you are away on vacation you can give the appearance of someone being home by having smart shades for added security? This is all possible, and quite literally at your fingertips. Elite Smart Shades™ are here for you with options for every lifestyle. Elite gives you choices such as remotes, wall switches, mobile apps and integration options with your home automation system. Elite’s automation solutions offer a wide range of fabric and pattern options and are available with Roller Shades, Elite High-Lite™ Shades, Cellular Shades, Sheer Horizontal Shades and 2″ Horizontal Blinds. Controlling your window’s shades and blinds has never been as easy as it is today. Walk in to your living room and raise your shades with the click of a button on the wall. On the couch in the family room watching your favorite TV show, lower your shades with a handheld remote. Laying on the beach in Mexico, give the appearance that your home is occupied by lowering or raising your shades using a mobile app on your trusted smart phone. 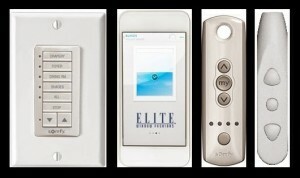 Most recently, Elite has added E-Touch wand controls (attached to the shade or blind) to their roster of automation controls. With the wand easily available at your fingertips, simply press the up or down button to raise or lower your shade, no longer do you have to turn a wand a dozen times or pull a cord to raise and lower your shade or blind. Power your shades with a wired solution or battery. Elite also offers a rechargeable battery with solar panels (optional charger is available to quickly recharge battery if necessary). Allow the sun to power your automated shades and save even more through it’s extended battery life. Your shades can be programmed to open and close automatically at a certain time. Your shades can be programmed to automatically close when temperatures rise which in turn assists with lowering your energy costs. Avoid awkwardly trying to reach over furniture just to eliminate glare. Elite Smart Shades™ can be 100% customized to the measurements of your window for a perfect fit. Automated shades and blinds are cordless making for a much safer environment for your children and pets. Why wait any longer? Find your closest Elite Smart Shades™ Specialist and contact them for more information today!